São Tomé and Príncipe, a small island positioned in the gulf of Guinea, is considered one of the 200 most important biodiversity hotspots in the world. Many of its important species and their habitats are threatened. Until recently very little information was available or known about deforestation and ecosystem loss. Earth observation has proved a powerful tool to learn about the process of deforestation and to spot the places where interventions are needed the most. Sao Tome and Principe hosts an extraordinary amount of endemic bird and plant species for an island of its size. The island has a large protected area, the Obo National park, which covers around 35 per cent of the country's surface. Signs of deforestation in the park and its buffer zones, an environmental impact that negatively affects local livelihoods, was a main reason for the GEF-IFAD intervention. Before the start of the project, greater knowledge on the specific spots of deforestation was needed. This information will continue to be beneficial in the future, when the impacts of the project need to be evaluated. The European Space Agency financed a project from IFAD preformed by Geoville, to demonstrate how IFAD could benefit from Earth observation data. The project created some interesting observations on forest coverage in São Tomé and Príncipe. Earth observation was not an easy task due to the climatic conditions of the island – most of the time the surface is covered in fog and clouds. Some areas could only be observed with the help of radar data, going through clouds but of a lower quality since the clouds lower the view. This data has been combined with optical data, which has a high quality but does not show what is under the clouds. These challenges made it impossible to detect illegal logging on a micro scale. Although the mapping was far from an easy exercise, deforestation is clearly seen in the period between 2009-2013. 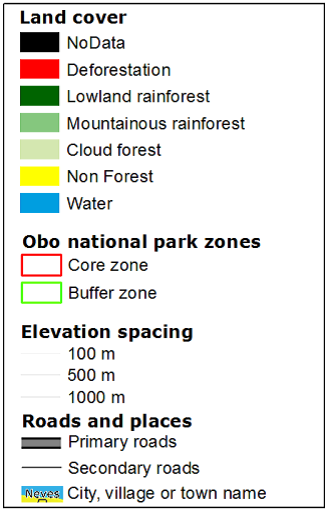 The deforested regions are painted red on the map to the right. 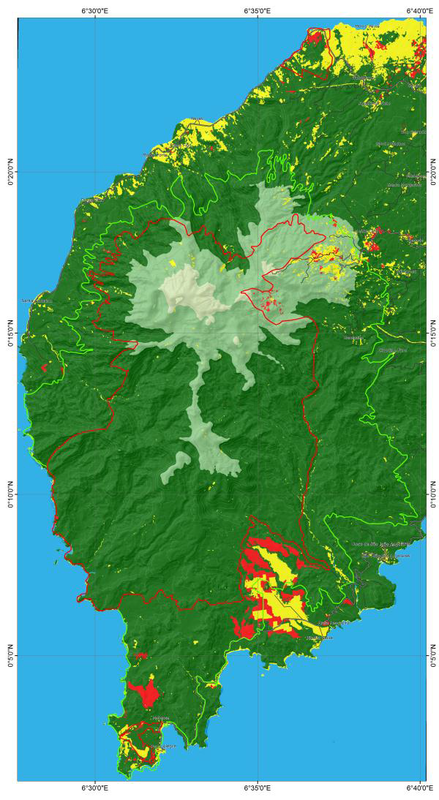 Those areas where deforestation is observed are mostly near large oil palm and cacao plantations. Interestingly, these are the same locations that were given to foreign companies for operation. In addition, there are signals of a shift towards more heterogeneous and invasive crop cultivation in regions with high deforestation rates. These findings created a rich source of information on possible causes of deforestation and provide important inputs for the project. In the near future, earth observation has even more potential. The European Space Agency will soon start two new satellite missions that will generate new datasets of earth observations. The missions carry a range of technologies, such as radar and multi-spectral imaging instruments for land, ocean and atmospheric monitoring. The benefit of these missions is that all data can be accessed for free. This new open source information will decrease the costs of new mapping exercises. In addition, maps can be enriched with more precise information, as in the case of participatory mapping. These maps can include community information, such as local water stream information or land tenure systems, so they can be used for specific, local purposes. considers the decreasing costs of future exercises due to the free data and the possibility of additional applications to the maps, the potential of earth observations is substantial.